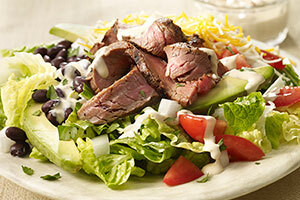 Buy Sutton & Dodge® Flank Steaks. Heat grill to MEDIUM-HIGH. Combine oil, sugar, garlic salt, oregano and cumin in small bowl. Rub evenly onto steaks. Grill until rub is slightly charred, 5 to 7 minutes. Turn over and grill 5 to 7 minutes longer until fully cooked. Transfer steaks to a cutting board. Let stand 5 minutes before thinly slicing against the grain and cutting into bite-size pieces. Arrange about 2 cups chopped romaine on each of 4 large plates. Top with black beans, avocado, tomatoes, onions, cilantro, shredded Mexican-style cheese and cut grilled steak. Serve with chipotle ranch dressing.